The cells and cytokines of inflammation, where control is everything. Inflammation is the 21st century epidemic, with a growing impact across chronic diseases prevalent in our societies. Aberrant control of inflammatory cells and cytokines is a key factor in rheumatoid arthritis, inflammatory bowel disease, diabetes, neurodegenerative disease and chronic pulmonary, vascular and liver diseases and in cancer. 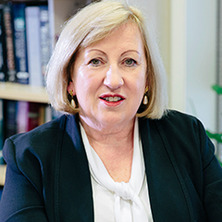 “We aim to understand the cellular processes that regulate inflammatory cytokines and find ways we can intervene in order to ameliorate inflammation in chronic disease,” said Group Leader Professor Jennifer Stow. We are discovering new molecules, pathways and membrane domains within macrophages that impact on inflammation through receptor signalling and trafficking, cytokine secretion and the phenotypic programming of macrophages. Our research uses complementary approaches of cutting edge microscopy and image analysis, gene expression and knockout, advanced protein biochemistry and cell-based assays to explore the molecular cell biology of macrophages and other cells. We partner with other groups in the IMB Centre for Inflammation and Disease Research and others around the world, for multidisciplinary research. Video: Lattice light sheet imaging of live, ruffling macrophages. Exploring drug effects and gene knockouts in cells and animal models. Membrane subdomains for signalling at the cell surface and in endosomes. Macrophage host-pathogen interactions and phagocytosis. Summary of research interests: My group studies how immune cells fight infection and cancer. In the immune system, macrophages are responsible for eating (phagocytosing) and killing bacteria and other pathogens. Macrophages also secrete cytokines that control inflammation – the process that fights infection but also underlies many diseases, including cancer. Identifying the genes, proteins, membrane domains and signalling pathways that control pathogen detection, phagocytosis and cytokine secretion is a main focus of our work. From this research we are identifying new uses for existing drugs and defining targets for developing new drugs to treat infection, cancer and inflammatory diseases. Kinase inhibitors in macrophages (new treatments for inflammation and cancer. Professor Jennifer Stow is currently Deputy Director (Research) IMB and a member of the IMB Centre for Inflammation and Disease Research, which aims to find novel strategies and treatments to address the rising tide of inflammation affecting many millions of people and ageing populations around the world with chronic disease. The Centre partners with clinicians and industry and engages with public groups to research inflammation in liver and bowel diseases, chronic pulmonary disease and neurodegenerative diseases. Inflammation as a key element in cancer and infectious diseases is also addressed by our research. Our research is generating new leads and target molecules for developing drugs and for repurposing existing drugs. Our findings are published in high-level journals, delivered at conferences and advanced in collaboration with groups around Australia and the world. and CIDR affiliated clinicians, other research groups and industry partners. Our group is a member of the UQ-based Australian Infectious Diseases Research Centre for collaborations involving host-pathogen interactions. BioImaging Analyst Network in Australia. We collaborate with cell biology and immunology groups around the world in the USA, Germany, Japan, UK and Chile.